Since the 1956 Guthrie Tamburlaine, there have been several productions of varying degrees of importance. On 14–21 June 1960, the two parts were performed by the Oxford University Dramatic Society in St John’s College Garden. As in all productions in the twentieth century, the two parts were abridged considerably by the director, John Duncan, the performance being about three hours long and the subplots omitted. 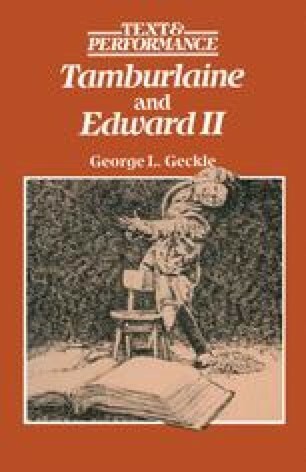 The reviewer in The Times (15 June 1960) liked the production, thought Tamburlaine’s affair with Zenocrate nicely handled and was impressed with the spectacle of a cast of over 100 in an acting area of 35 by 40 yards, but, as he further noted, with such distances ‘subtlety becomes impossible’. Harold Hobson in The Sunday Times (19 June 1960) likewise appreciated the visual spectacle — ‘the stringing up of one of Tamburlaine’s enemies, and the spout of blood when he cuts the throat of his son, are particularly notable’ — and also had kind words for the verse speaking and for the acting, especially of Peter Holmes as Tamburlaine. Kenneth Tynan went even further and called the production ‘the most accomplished thing the O.U.D.S. has done for years’ and stressed the effectiveness of the stylisation of the acting (Tynan Right & Left, London, 1967, p. 25).